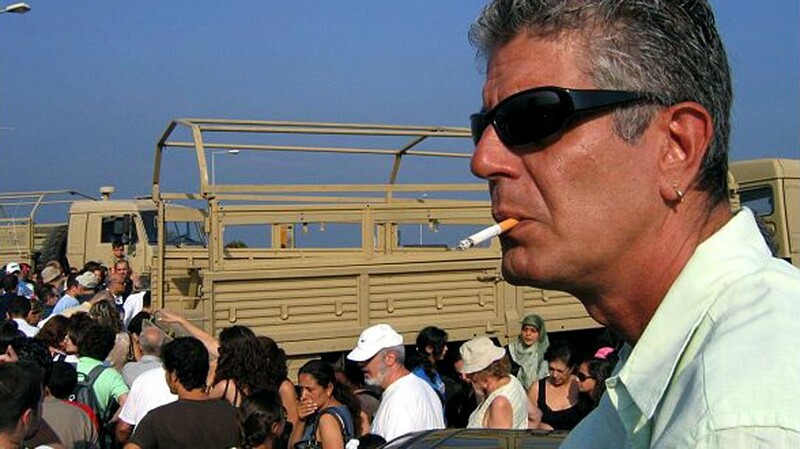 Anthony Bourdain is dead. This is my attempt at catharsis after the initial shock. In every stage in life, there are some people that unexpectedly affect how you think, what you like, who you become. They are not the most important people in your life, not the ones you love the most or even think of or talk to everyday. It might be the case of an uncle who likes to take photographs and takes the time to show you how to do it too. A friend who is passionate about TV series and drags you down the rabbit hole of binge watching, even though till then you would not care about TV more than the casual zapping now and then. A musician whose songs you discover during a random shuffle, opening a door onto a whole new reality of sounds that you didn’t know existed. Years will pass and you might not care about what they showed you anymore, moving on to new interests, new obsessions and affections. You might look back at that time with nostalgia and even get lost in your thoughts for a moment when you hear a tune from that era, smell a familiar scent or come across that same person on the street. But till then, until you become a different person that does not care anymore, they are part of your daily routine, a presence in the little things that you don’t notice at all. For me, at this stage in my life, Anthony Bourdain was such an unexpected presence. Looking back, I never really cared about cooking as a child. It’s not like I felt aversion towards the kitchen, I liked messing around when my mom would cook, tasting the meal when it came piping hot out of the oven or circling around to make sure I got the best part of the Sunday roast. Later I would find myself in the kitchen, preparing late night snacks or cooking lunch when nobody else was home, instead of simply getting take out. Cooking for me was one of these things of the daily routine that one does not care about, but also never stops doing. A couple of years ago I came across a video of Anthony Bourdain. I can’t remember neither how I found it, nor what it showed, not even why it intrigued me at the time — although I have some very good ideas about that last part. What I know is that more and more I would look out for his work. I started watching random episodes of “No Reservations”. I would watch for hours at videos of him explaining cooking techniques, criticizing eating habits or simply joking about his travels. I liked and, more importantly, I understood his take on the world and his sense of humour. Watching him go into kitchens all over the globe, I absorbed a world that I only academically knew existed up till then. I went on to read some of his writings, like “Don’t Eat Before Reading This” or “Medium Raw”. His prose contained everything I like about contemporary pop fiction, either in literature or magazine articles. The irony, the tongue-in-cheek attitude, the inside jokes, the anecdotes about life behind closed doors — simply reading them gave me that unique feeling of being part of a prestigious elite. My own commanding and understanding of the English language both aligned well and was expanded by his mannerisms. His take on world culture, the openness to new tastes and experiences, even his politics views in some cases, resonated with my personal sensibilities very well. Slowly, my whole mentality towards food changed altogether. I would search for and try new recipes, follow cooking shows and blogs, looking up kitchen equipment to the point of actually owning a chef’s knife — technically a gift, but one that I actively lobbied to get. I even joked once that, if my current job did not work out, I could simply end up cooking in some kitchen in a couple of years. I would spend hours reading about the science behind cooking each type of meat perfectly. I started noticing the little things, like the fact that the awesome steak I was eating at the restaurant was actually tenderloin, arguably “the most boring and uninteresting piece of meat”. Every now and then I would go back to the work of Bourdain. I have not watched every single episode of his shows, not even half of them, and the one book of his that I started reading is still halfway through. He still remained the go-to choice though when I wanted to visit any place on Earth. When I went to Amsterdam for a month in the summer, I was surprised to find that there actually was no “No Reservations” episode about it — and thus I discovered “Parts Unknown”. When I moved to Scotland, the first weekend all alone thousands of miles away from home, I watched the London/Edinburgh episode, comforted by the fact that a familiar voice was describing the unfamiliar environment I had found myself into. When the face of Bourdain appeared in the “Suggestions” section of YouTube I’d usually watch the video — or, more precisely, re-watch it. He was a constant presence in, and the catalyst of, the ever-expanding culinary part of my life. Ironically enough, I had to hear the news of his death to fully comprehend this. I know the face that people make when you say that you are shocked by the death of a celebrity. The rolling of the eyes that they try to hide, the polite and bored agreement of what you say, not really caring or understanding how you could care so much about “someone you never met”. I’ve done these exact things myself many times. It is easy to forget that anyone can be touched by even the smallest of things. That a simple piece of music, a photograph, a film, some words that somebody else created in a whole different setting, with entirely different purposes or feelings than your own, might end up changing your world perspective, changing you, creating you. And so tonight, once again, I’ll hold the cold beer bottle, smelling the alcohol under the summer night, watching Tony smoke a cigarette and listening to him reminisce about a journey, wondering philosophically what awaits him next. Life is beautiful — even today.